Gorkha Janmukti Morcha president Bimal Gurung today appeared to extend an olive branch to Jana Andolan Party president Harka Bahadur Chhetri by expressing his willingness to welcome him back to the Morcha for the sake of Gorkhaland. Gurung arrived here on his stated mission of ensuring the Morcha's victory in the ensuing municipality elections with a message of conciliation to disgruntled supporters who have been leaving the party in droves over the past fortnight. "People who in the past had left the party for whatever reasons have returned and I am confident those who are leaving now will also return for the sake of Gorkha identity," he said. Asked if he would also welcome Chhetri, who was the most articulate face of the Morcha before he quit in September 2015, back to the party, the GTA chief executive answered in the affirmative. "He is welcome. For the sake of Gorkhaland, he is welcome," he said. Gurung, however, said there was no need for his party to make a formal approach to Chhetri for his return. 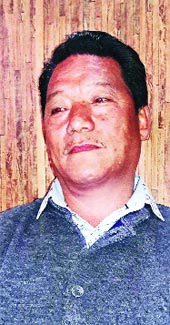 Gurung's decision to camp in Kalimpong for two months is a clear indication that he wants to set his party's house in order in the newly created district where Chhetri's JAP has a strong following and where, of late, the Trinamul Congress has been gaining a lot of ground. The Morcha president, however, scoffed at suggestions that he was worried by the mass desertion. "I have said in the past that all are welcome to receive any benefit that is coming to them, be it in the shape of the board. However, when it comes to the issue of Gorkha identity, I am confident all will come together as one," he said. In the last Assembly elections, even though the Morcha's Sarita Rai had defeated Chhetri in the Kalimpong seat, the victory margin was a shade over 11,000 votes. In the previous elections, the Morcha had won the seat by nearly one lakh votes. In fact, the winning margin of the Morcha in the three hill Assembly seats of Kalimpong, Darjeeling and Kurseong went down by 68.5 per cent as compared to the 2011 results. Gurung also welcomed the formation of Kalimpong district and thanked chief minister Mamata Banerjee for it. He, however, said the new district should be a full-fledged one like the Darjeeling district and not just a token arrangement.